Times may be tough but they’re good for the Marx collector. This latest entrant to the lists does valuable work in giving us three major statements. Feste Im Herbst derives from a Marxian revamping of the last movement of his vast Herbstsymphonie and in stand-alone 1946 form it sounds well. It opens with harvest-heavy teem – one is sometimes tempted to lard the Hopkins compounds when discussing some of Marx’s orchestral works – and continues in much the same vein. Peasant song and heavy booted country corn richly imbue the writing; intensely lyrical its sing-songery verdant, bucolic, but well structured, often irresistible. The quiet affirmative ending is a closure of surety and repose. It’s played with warmly balanced appreciation of its essential lyricism. Eine Frühlingsmusik dates from 1925. Powerfully chromatic, bespeaking Debussy - one of the most obvious influences – this is again, as one would expect richly infused with nature writing of sensuous power and great expressivity. The surging and singing strings reach a pitch of effulgence, with Marx reserving the most audible appearance of the brass for some intriguing sinewy blocks. This is writing of concentrated generosity embodying a personal nature vision very much Marx’s own. 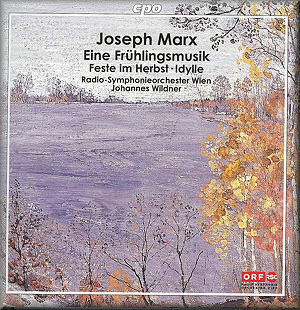 The Idylle was composed in the same year as Eine Frühlingsmusik. It too bears the stamp of Debussy – his Prelude. It’s slow and luxuriant and sports some quivering wind lines and scurrying harp as well as torpid, quietly luminous strings. One senses the undergrowth gently teem. Though Marx has often been seen as an inheritor of the Debussy-Reger-Korngold-Strauss lineage, in these three works it’s Debussy who casts his spell most evocatively and persistently. Even in those moments when thematic material can sound rather over-stretched it’s the warmly hued writing that keeps things alive in its chromatic richness. There is a performance of both Eine Frühlingsmusik and the Idylle played by the Bochum Symphony and Steven Sloane on ASV CDDCA1137 but it’s not one to which I’ve had access. The CPO recording is extremely fine – rich but not too resonant and expanding to catch the fortes. The orchestral sections are well balanced and the string choirs of the Radio-Symphonieorchester Wien whilst clearly not as voluptuary as their counterparts in the Musikverein are very acceptable indeed, especially when they are directed as appositely as they are by Johannes Wildner.